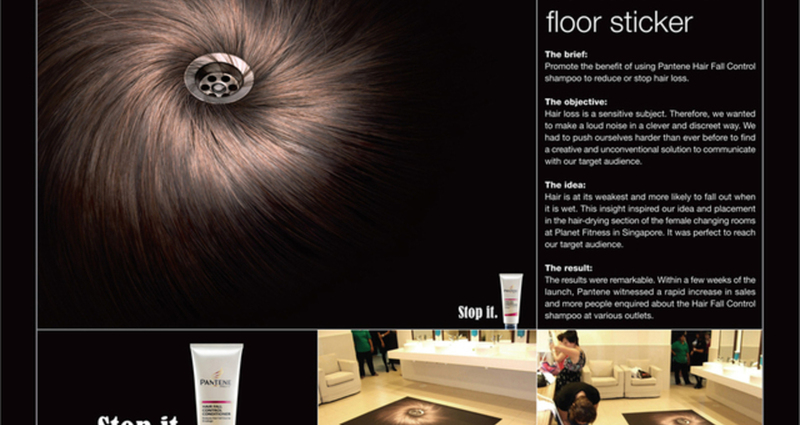 Promote the benefit of using Pantene Hair Fall Control shampoo to reduce or stop hair loss. Hair loss is a sensitive subject. Therefore, we wanted to make a loud noise in a clever and discreet way. We had to push ourselves harder than ever before to find a creative and unconventional solution to communicate with our target audience. Hair is at its weakest and more likely to fall out when it is wet. So placing the ad in the hair-drying section of the female changing rooms at Planet Fitness in Singapore was perfect to reach our target audience. However, the hardest challenge was blending the drain with the crown of the head to make it look as real as possible.